Beloved Masters, in your mind's eye, however you perceive, envision that you are viewing the Earth from a great Light ship, and together we, the angelic Forces and the multitude of universal Light Beings who represent our Father/Mother God, are bringing forth the energetic vibrational patterns of the wondrous Divine schematic in preparation for humanity's inhabitation of the Earth. During the intricate, complex stages of preparation, great sentient crystals were implanted deep within the Earth in strategic places around the planet. A portion of each huge crystal rose from the Earth's surface as a sentinel which radiated energy and information out into the cosmos, as well as functioning as a receiver of Divine Light, Wisdom and Power from our Father/Mother God. Over the many aeons of time, as Earth changes took place whereby mountain ranges rose into the skies, land masses sank beneath the waters, and continents shifted and changed shape, most of those great crystals were shattered and buried deep within the Earth and the waters. However, many remained intact deep within the waters, in great caverns, and many more lie close to the surface of the land hidden only by a thin covering of earth or vegetation, waiting for you to discover them and bring forth their powerful gifts and ancient memories. They are the Earth's Seed Atom Record-Keepers, and you hold the key which will give you access to the wisdom and the power of manifestation that lie dormant within them. Each one of you bears within the Essence of your Soul, your DNA and your personal God-self such wondrous gifts, such magical energy and a vast memory bank of universal information and history. All of these stories that are now being told and the ancient memories that are being accessed, don't you realize that you were there? Perhaps it was not always specifically you in physical form, but at times it was a close member of your soul family. You do not have to personally experience everything that has happened during this great journey throughout the universe and on Earth to be a part of it or to have it in your memory bank, for you have a lifeline, a soul memory connection with your immediate soul family, which creates a link whereby they will gain the data and wisdom from your experiences, and their experiences are seeded into your memory storehouse as well. The return to harmony and balance begins within each of you. Unity consciousness can begin with you, here and now, in this moment. First, it is vitally important that you acknowledge and bring forth into your consciousness all of those unbalanced fragments that you have created during your many lifetime experiences--those things that control you, those things that have created an emotional and mental prison around you in your auric field. Then, you must become aware of these fragments and how they affect your reality, and through your conscious intent you must create a desire to change and to fill those fragments with transformative Love/Light energy. We are always ready and willing to assist you in your positive endeavors, but you must ask and give us permission so that we can reinforce your resolve, so that we may give you the necessary knowledge along with swiftest and best way to accomplish your transformation with ease and grace. Know that everything, at some level, is seeking the Light--seeking balance and harmony-- seeking to return to that which it was in the beginning. Each phase of new awareness or expanded consciousness has its special miracles and benefits which are to be savored and enjoyed. Each time you release some old self-limiting, painful thought form, habit or discordant energies within, you are transformed, and you remove a small (or large) part of your disguise, which allows you to integrate another facet of your wondrous God Self. In doing so, you are gradually creating a new empowered you. A new reality opens to you whereby you have access to many new concepts, as well as new talents, and your sensitivity to the exquisite nuances of Spirit miraculously unfolds around you. If you could truly see the grid system, the web of life or the connection of all things, you would have a better understanding of the concept of Oneness. It is not just the Earth that has an intricate grid system. You have streams of Light that radiate forth from you and to you, one to another, back and forth amongst every person on Earth. Some are stronger, some are weaker, but you are still intrinsically connected with everyone and everything on your planet and even within this Sub-universal expression. This may be mind-boggling and hard for you to imagine, but it is true. When we say you are all one, what does this really mean and how does this happen? It is because there are those streams of Light that penetrate and filter through everyone, around and through all of the Earth. Yes, most of these streams of Light are very weak, but more and more of these streams of Light are growing stronger and are setting up a vibration of recognition. There is an echo from within that says, "Yes, I remember you. Yes, I know who you are, and I know we have been together before. I don't know where, but I feel and recognize your vibrations and your energy signature. You touch my soul and make my heart strings sing. Your loving Essence assures me that I am no longer alone. Welcome into my heart. I ask you to share my journey and to allow me to be a part of your journey as well." You have heard that for a very long time there was a quarantine around the Earth, this solar system and even your galaxy, which has now been dissolved so that you may receive galactic, universal and Omniversal information. We now tell you that there was also a filter placed around this universe. This universe, in which we all are playing an integral part, is one of the most recent universes to be created from the Essence of the Supreme Creator, and therefore it is a universe that is situated at the farthest edge of Creation. We too have been limited in our knowledge of the workings of the Omniverse, as well as the amount of higher frequency vibrational energy that we have had access to. You see, the first universes that were created were the most powerful and the closest to perfection, for they surrounded the Great Central Sun of the Supreme Creator and contained the pure Essence of Creation. As more and more universes, galaxies, star systems were created, ever-expanding and pushing Creation further and further out into the Great Void (and further away from the Supreme Creator), each refraction into density meant each new creation had less of the perfection of the All That Is. You must realize that we are ALL much stepped down energetic fragments, but still an integral facet of the magnificence of the Supreme Creator. And if we were sent forth with the command to create in the Creator's name, for it was the Creator's desire to experience more of Itself, why would the Creator tell us what we were to create? We were given a blessed Divine gift as cocreators, and so were each of you. You are a co-creator god in your own right, and that is not sacrilegious; it is a universal truth. You must understand that is why you are here on Earth; that is who you are. Don't let anyone tell you any different. Remember, you are also responsible for your own creations through the laws of cause and effect. Each of you is the center of your own universe. You, as a cocreator, send out energy and intent which create thought patterns of a certain frequency. These higher frequency vibrations go forth from you as Rays of energy in an infinity sign, creating wave forms, which are a reflection of your conscious thoughts, intention and actions. As you learn to stay heart-centered and soul-focused, thereby always radiating unconditional love and balanced/harmonious vibrational patterns, your world and reality are gradually changing for the better, for you are functioning as an empowered master of cocreation--a true Divine emissary of our Father/Mother God and the Supreme Creator. During these times of uncertainty and great change, remember, my beloved warriors of Light, there is nothing to fear and so very much to be gained. Feel the warmth of our sacred breath as it brushes your cheek, sense the aura of love in which we surround you. We are near: reach out and touch us. We will respond. You are loved most profoundly. I AM Archangel Michael. ONE OF THE MOST SACRED PLACES ON THE PLANET? 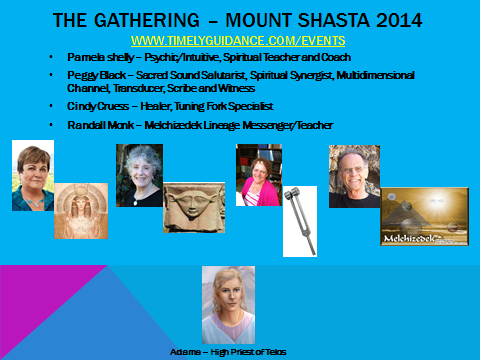 Speakers include Pamela Shelly, Peggy Black, Cindy Cruess, and Randy Monk. *** BOOK 2: THE GOLDEN PROMISE: $15 ** BOOK 4: LET THERE BE LIGHT: $15 * OUR STUDY MANUAL: REFERENCE & REVELATIONS * GLOSSARY AND ILLUSTRATIONS: $18 * PLUS S & H * YOU MAY ORDER THE ABOVE ITEMS OR ANY OF OUR PRODUCTS FROM OUR SECURE WEBSITE: www.RonnaStar.com. OR CALL CINDY AT: 775-856-3654 * MONDAY, WEDNESDAY AND FRIDAY * 9:30 TO 2:30 PM. (Cindy will adjust the price to reflect the sales price when she processes your order). BOTH 12-1 & 12-2 CD'S: ................................................................ $20. Plus S & H.
12-2 * USING THE UNIVERSAL LAWS OF MANIFESTATION * LIVING EACH DAY AS A MASTER * MEDITATION: INTEGRATING YOUR HIGHER SELF * .............................................$11. Plus S &H.
Cindy and I will be taking some vacation time in June. We will be in and out of the office - no set times or days. Orders will take a little longer than usual-we will process them as quickly as possible. We will also endeavor to respond to any voice mail messages in a timely manner.